Hypernova: Illegal Indie-Rock from Iran In Iran, people aren't allowed to listen to Western music, let alone make it. But that hasn't stopped Hypernova, an indie-rock band from Tehran influenced by groups such as The Strokes, from rocking in the shadows. Iran's Hypernova is an underground band by necessity: Western-style music is banned by the country's Islamic regime. To download right-click (pc) or ctrl-click and save the link to your computer. From the CD Who Says You Can't Rock in Iran? In Iran, people are not allowed to listen to Western music, let alone make it. But more than half of Iran's population is under 25 years old. So it's not surprising that young Iranians download music off the Internet, watch satellite TV and make music in a thriving underground scene. Hypernova is an indie-rock band from Tehran influenced by groups such as The Strokes, the Arctic Monkeys and Queens of the Stone Age. Their new CD is called Who Says You Can't Rock in Iran? ; they recorded it illegally in their home country. Lead singer Raam says, "There's an element of danger involved in what we do. But the laws are so chaotic back home that they're hardly enforced. Ninety-nine out of 100 times you can get away with anything." 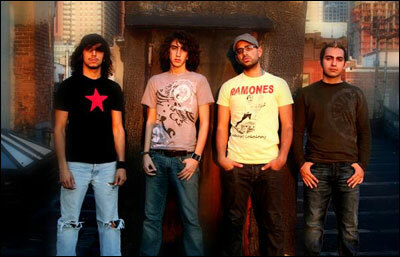 The Iranian indie-rock band struggled for seven long years in Tehran. They played shows in dank basements and at kids' birthday parties. One day, Raam decided to try for the big time: the South by Southwest Festival in Austin, Texas. Raam recalls: "I got this e-mail: 'Congratulations! You've been accepted to showcase the festival.' I thought it was spam mail or something." The trip was not easy. "We had to go to Dubai, because there's no U.S. consulate in Iran," Raam says. After traveling from Tehran to Dubai, the band was denied visas. Heartbroken, they waited and applied again — this time, with a faxed letter from Sen. Charles Schumer (D-NY). Hypernova eventually got the visas, but the band missed the South by Southwest music festival. Despite the setback, Hypernova continues to tour. Raam says Hypernova's members are living their dream in the United States. Soon they will be back in Tehran, rocking in the shadows.